Gardeners in search of a dependable, brightly colored plant to light up shaded gardens need to look no further than the Japanese painted fern (Athyrium niponicum). This dazzling import from the Far East sports multicolored fronds, which can stretch up to 18 inches long, in partial to fully shaded areas. It is a beauty that cannot be ignored–even where the sun doesn’t shine. The Japanese painted fern loves moist, humid conditions, making it a great plant for the Triangle region. In well-drained, humus-rich soil, this hardy perennial spreads by creeping rhizomes, forming colony clumps that can be divided in the spring to add its brilliant beauty into other nooks and crannies of a dimly lit landscape. This fern, which is deer-resistant, can stand some drought, but it survives rather than thrives in such conditions, so supplemental watering when the rains don’t come is advised. But don’t think this plant has to be babied through the growing season. It is tough, and as long as its moisture needs are met, the Japanese painted fern can even make a pleasing addition to shady container plantings and hanging baskets. 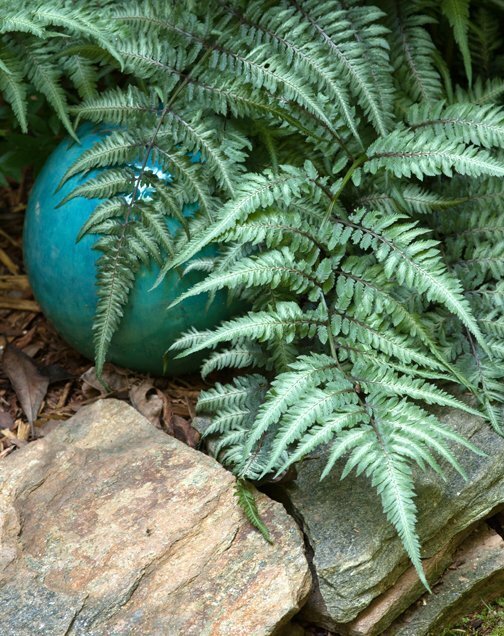 Japanese painted ferns really don’t require a lot of fertilizer, so, if you have the need to feed, use either an organic or time-release fertilizer at half the recommended rate of other perennials. Although these ferns will do well in the shadowy realms of the garden, don’t treat them like botanical vampires. In fact, if they are situated in an area that receives a few hours of early morning sun, their colors tend to be more intense. For many years, the selection ‘Pictum’ has been a prize catch for Japanese fern fanciers, and no wonder—its elegant glow has drawn gardeners to it like moths to a flame. This beauty has variegated green fronds heavily dusted in silver and supported on wine-red stems, which makes for a real tricolor treat. ‘Pictum’ was even named the 2004 Perennial Plant of the Year by the Perennial Plant Association. But now ‘Pictum’ has plenty of friendly competition. For instance, ‘Burgundy Lace’ is a similar stunner, showing off light green fronds splashed in silver and purple stripes. Also consider the spectral beauty of ‘Ghost’—which is actually a hybrid cross of ‘Pictum’ and the southern lady fern (Athyrium filix-femina)—casting its spell with striking light gray foliage. Ditto for ‘Silver Falls’ displaying shimmering silvery fronds complemented by reddish-purple veins. There are other choices, of course, as there will be plenty more in the future because the Japanese painted fern has come, has been seen and has conquered Triangle landscapes. It is a friendly invasion that has brought dazzling beauty into the shadows of local gardens.